Central nervous system (CNS) vasculitis in children can be primary or secondary to an underlying systemic disease (systemic vasculitis, systemic connective tissue disorders, and infections). Childhood polyarteritis nodosa (c-PAN) is one of the rare causes for CNS vasculitis. c-PAN is a systemic necrotizing medium-vessel vasculitis with predominant involvement of the skin, gastrointestinal system, and renal and nervous systems. Nervous system involvement is less frequent, with the peripheral nervous system more commonly involved than the CNS., Our patient presented with severe neurological deficits due to CNS vasculitis of both the anterior and posterior circulation. CNS vasculitis as a presenting manifestation of c-PAN is quite rare, with a very few cases reported in the literature so far. A 14-year-old female child came with 1-week history of fever, leg ulcers [Figure 1]a, altered sensorium, and weakness of all four limbs. She had a history of intermittent fever, myalgia, and significant weight loss over the past 6 months. On examination, she was febrile with hyperpigmented erythematous ulcerative lesions over both the lower limbs. On neurological examination, she had gaze deviation, withdrawal response to pain, and generalized hypertonia with a Glasgow Coma Scale (GCS) of E3M4V1. Since she had bulbar weakness, she was intubated and ventilated. As she had skin lesions with systemic symptoms and neurological involvement, a possibility of primary vasculitis or lupus was considered, and a complete autoimmune workup was done. Her investigations revealed a total leukocyte count of 15,521 cells/mm3, platelet of 584,500 cells/mm3, ESR of 60 mm/h, and CRP of 63 mg/L. Her C3 was <40 mg/dl and C4 was less than 8 mg/dl. She had proteinuria with a urine protein creatinine ratio of 2.59. On cerebrospinal fluid analysis, protein was elevated (559 mg/dl) with normal sugars and cell counts. On immunological workup, her antinuclear antibody (ANA) (by indirect immunofluorescence), ANA PROFILE (by immunoblot), and antineutrophil cytoplasmic antibodies (indirect immunofluorescence) were negative. She tested negative for viral markers, antiphospholipid antibodies, and serum cryoglobulins. Nerve conduction study was suggestive of axonal neuropathy of both the lower limbs. Skin biopsy [Figure 1]b revealed leukocytoclastic vasculitis (with fibrinoid necrosis) of the small and medium vessels along with the involvement of the dermis and subcutaneous tissue, suggestive of a medium-vessel vasculitis. Renal biopsy [Figure 2] showed the features of mesangioproliferative glomerulonephritis, tubulointerstitial inflammation with the deposition of immunoglobulins (IgG, IgM, IgG, and IgA), and complements (C3, C1q). On magnetic resonance imaging of the brain [Figure 3]a and [Figure 3]b, there were multiple acute infarcts in the right frontal periventricular white matter, bilateral pons, left thalamus, bilateral posterior limb of the internal capsule, left middle cerebellar peduncle, and right cerebellar hemisphere. On magnetic resonance angiography (MRA), there was luminal irregularity with the beaded appearance in the right superior cerebellar and anterior inferior cerebellar arteries [Figure 3]c.
The child was started on pulse methylprednisolone (1 g × 3 days) initially, followed by monthly pulse cyclophosphamide with a tapering dose of oral steroids. She was intubated in view of low GCS for airway protection. Since she had a suboptimal response, a trial of intravenous immunoglobulin (2 g/kg, divided over 5 days) was also given. At the end of 3 months, her proteinuria came down significantly with no major improvement in her neurological status. She got three pulses of monthly cyclophosphamide and presently her GCS is E4M3Vt (tracheostomy) with hypertonicity of the limbs, for which she is on baclofen, gabapentin, and diazepam. On admission, she was encephalopathic with gaze deviation and hypertonicity. Progressively, she showed mild improvement in the form of emotional response with varying tonicity of limbs and did not deteriorate further. 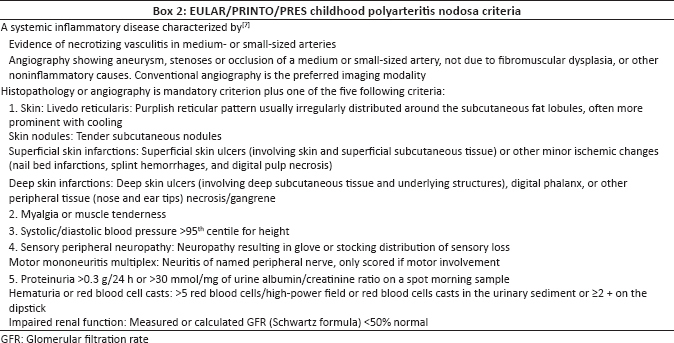 Our patient had histological evidence of necrotizing vasculitis with skin involvement (skin infarctions and ulcers), myalgia, peripheral neuropathy (documented by nerve conduction study), and renal involvement satisfying the below [Box 2]-mentioned EULAR/PRINTO/PRES criteria for childhood PAN. The sensitivity and specificity of this new c-PAN criteria is 89.6% and 99.6% in comparison to 94.7% and 95.2% of the original adult PAN American college of Rheumatology (ACR) criteria. She also had persistent elevated total counts and platelets, in favor of a primary vasculitis. However, the low complement (C3, C4) levels and the renal biopsy finding (mesangioproliferative glomerulonephritis, tubulointerstitial inflammation, and full-house pattern on immunofluorescence staining) were more in favor of lupus. However, she had persistent (repeated twice) negativity for ANA (immunofluorescence assay), ANA profile (immunoblot), and Coombs test. Low complements may be associated in patients with Hepatitis B virus- associated PAN but less likely in idiopathic PAN. Although rarely overlap of c-PAN and childhood lupus has been reported, persistent ANA/ANA profile negativity may not be supportive of such a diagnosis. However, rarely, cases of ANA-negative lupus have been reported. In a case series by Simmons et al., patients initially presented with lupus nephritis, with or without extrarenal manifestations and negative ANA. However, later on follow-up, they turned out to be serologically (ANA) positive for SLE. The duration for seroconversion had varied from 5 months to as long as 10 years. Hence, this also has to be borne in mind during the follow-up of such patients. In one of the largest single-center studies on c-PAN by Eleftheriou et al., 69 patients were studied, with fever, myalgia, and skin involvement (40/50 had necrotizing vasculitis on skin biopsy) being the common manifestations. Nineteen percent had renal involvement and only 10% had neurological involvement. 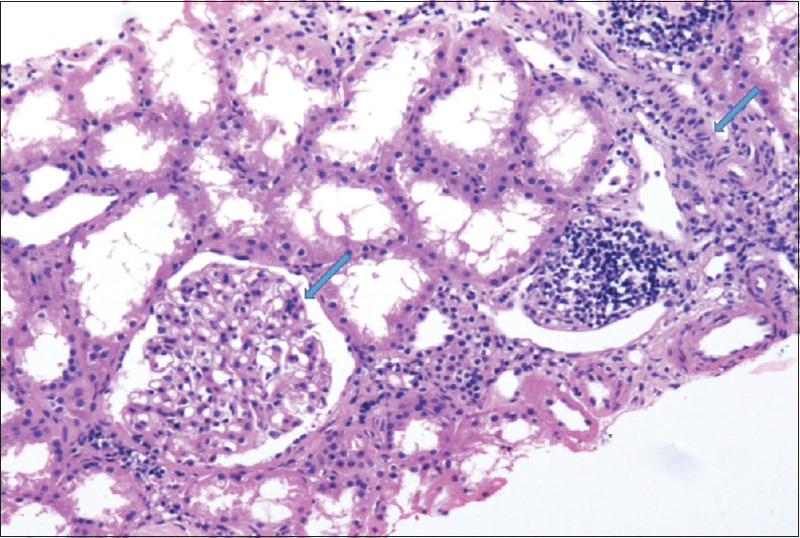 On renal biopsy, membranoproliferative glomerulonephritis with necrotizing vasculitis was more common and considered diagnostic, but some did exhibit focal segmental and crescentic glomerulonephritis. In a case series by Kumar et al. from Eastern India, three patients underwent renal biopsy, of which two had membranoproliferative glomerulonephritis and one had focal sclerosing glomerulonephritis. In another case series by Mondal et al. from Northern India, none of the 15 patients had renal involvement, with hypertension, peripheral neuropathy, and cutaneous involvement being the predominant manifestations. In a retrospective analysis of renal involvement in c-PAN, the 1- and 5-year survival rates were 72.5% and 60%, respectively, emphasizing the need to treat promptly and aggressively. Considering the rarity of c-PAN, the treatment protocols are extrapolated from the management of adult PAN. Corticosteroids ± cyclophosphamide (intravenous pulse therapy in severe cases) is considered as the first line of management. In refractory cases, intravenous immunoglobulin, plasma exchange, and rituximab can be considered. As maintenance therapy along with low-dose steroids, mycophenolate mofetil, azathioprine, methotrexate, or cyclosporine may be considered as steroid-sparing agents.,,, c-PAN in comparison to adult PAN has a more benign course with less renal and neurologic involvement and a shorter duration of the induction phase of the treatment. A new autoinflammatory disease due to deficiency of adenosine deaminase 2 has been reported, with its clinical and histopathological picture similar to PAN. It is characterized by recurrent systemic inflammation, elevated acute-phase reactants, livedoid skin rash, recurrent CNS involvement (ischemic or hemorrhagic strokes), and mild immunodeficiency. This condition has to be thought in refractory cases of c-PAN as they respond well to tumor necrosis factor inhibitors. In conclusion our case report highlight several important features. First, childhood PAN has to be considered among the differential diagnosis of CNS vasculitis. Second, diagnosis of childhood CNS vasculitis is challenging with MRA considered as the initial modality of imaging. And third, CNS involvement in c-PAN though rare can lead to devastating complications if not picked up early and needs to be managed aggressively with steroids and other immunosuppressive drugs. Elbers J, Benseler SM. Central nervous system vasculitis in children. Curr Opin Rheumatol 2008;20:47-54. Iannetti L, Zito R, Bruschi S, Papetti L, Ulgiati F, Nicita F, et al. Recent understanding on diagnosis and management of central nervous system vasculitis in children. Clin Dev Immunol 2012;2012:698327. Watanabe K, Rajderkar DA, Modica RF. 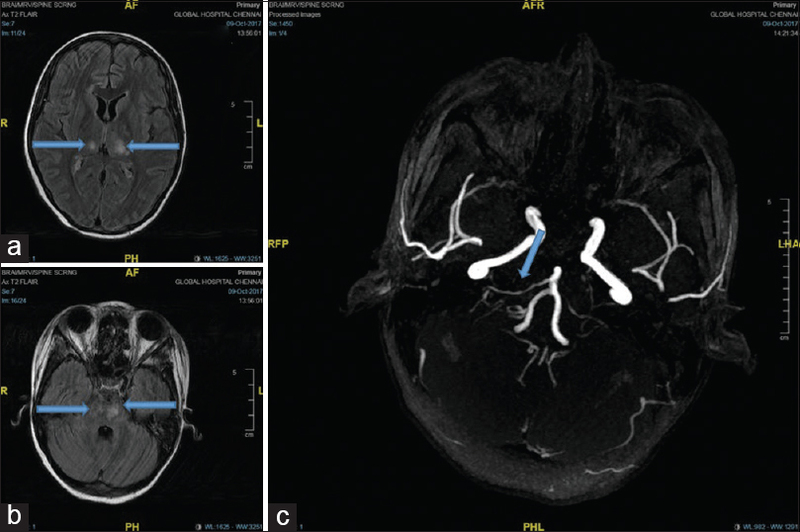 A case of polyarteritis nodosa associated with vertebral artery vasculitis treated successfully with tocilizumab and cyclophosphamide. Case Rep Pediatr 2016;2016:7987081. Weiss PF. Pediatric vasculitis. Pediatr Clin North Am 2012;59:407-23. Ozen S, Anton J, Arisoy N, Bakkaloglu A, Besbas N, Brogan P, et al. Juvenile polyarteritis: Results of a multicenter survey of 110 children. J Pediatr 2004;145:517-22. Eleftheriou D, Dillon MJ, Tullus K, Marks SD, Pilkington CA, Roebuck DJ, et al. Systemic polyarteritis nodosa in the young: A single-center experience over thirty-two years. Arthritis Rheum 2013;65:2476-85. Stone JH. Polyarteritis nodosa. JAMA 2002;288:1632-9. Marques VL, Guariento A, Simões MS, Blay G, Lotito AP, Silva CA, et al. Childhood-onset systemic polyarteritis nodosa and systemic lupus erythematosus: An overlap syndrome? Rev Bras Reumatol Engl Ed 2016;56:551-3. Simmons SC, Smith ML, Chang-Miller A, Keddis MT. Antinuclear antibody-negative lupus nephritis with full house nephropathy: A Case report and review of the literature. Am J Nephrol 2015;42:451-9. Kumar L, Sarkar B, Singh S, Bajwa RP, Joshi K, Malik N, et al. Polyarteritis nodosa – A few unusual findings. Indian Pediatr 1996;33:459-64. Mondal R, Sarkar S, Pal P, Nandi M, Hazra A, Sabui TK, et al. Childhood polyarteritis nodosa: A prospective multicentre study from Eastern India. Indian J Pediatr 2014;81:371-4. Besbas N, Ozen S, Saatci U, Topaloglu R, Tinaztepe K, Bakkaloglu A, et al. Renal involvement in polyarteritis nodosa: Evaluation of 26 Turkish children. Pediatr Nephrol 2000;14:325-7. Erden A, Batu ED, Sönmez HE, Sarı A, Armagan B, Arıcı ZS, et al. Comparing polyarteritis nodosa in children and adults: A single center study. Int J Rheum Dis 2017;20:1016-22. Caorsi R, Penco F, Grossi A, Insalaco A, Omenetti A, Alessio M, et al. ADA2 deficiency (DADA2) as an unrecognised cause of early onset polyarteritis nodosa and stroke: A multicentre national study. Ann Rheum Dis 2017;76:1648-56.